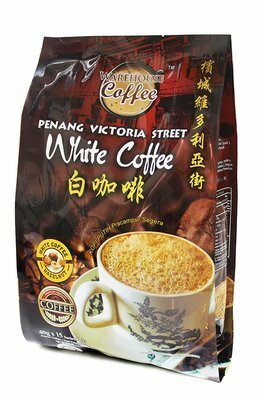 WC Penang Victoria Street Hazelnut White Coffee made from a blend lightly roasted Arabica and Robusta beans, Penang Victoria Street Hazelnut White Coffee is a smooth and mellow coffee that will satisfy your taste buds. Its aroma is inviting and it is creamy with the sweet, buttery taste of hazelnuts. The complex combination of the flavours of the hazelnuts and the coffee beans will ensure a comforting cup of coffee for a cold, cosy day. 1. Take one pack of warehouse coffee, pour the powder into the cup. Combine 120ml of boiling water. 2. Stir and insert the ice cubes and serve. 1. Take one pack of warehouse coffee, pour the powder into the cup. 2. Combine 200ml of boiling water. Stir and serve.